Feeling rather smug after not only completing our tasks (washing clothes, food shopping, blog-writing and communications) but also catching up on rest and relaxation on our two days in Bahía de los Ángeles, we woke up bright and breezy ready to get back on the road. The climate felt a lot hotter than the previous weeks, but we put that down to the specific bay we were in and the fact that we had been enjoying, and perhaps getting a little too used to, some air conditioning over the last couple of days. Bags packed, food and water loaded and legs fresh we eagerly set out to find out what the next section had in store for us. 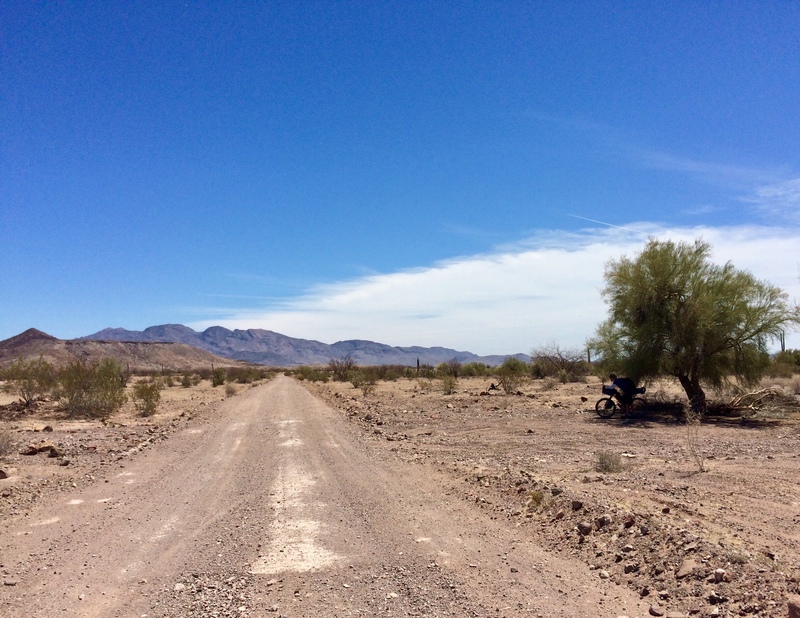 We had a day and a half of riding until we knew we would reach a ranch to get water and hopefully a meal, so we packed our usual five litre allowance each per day and the appropriate food. 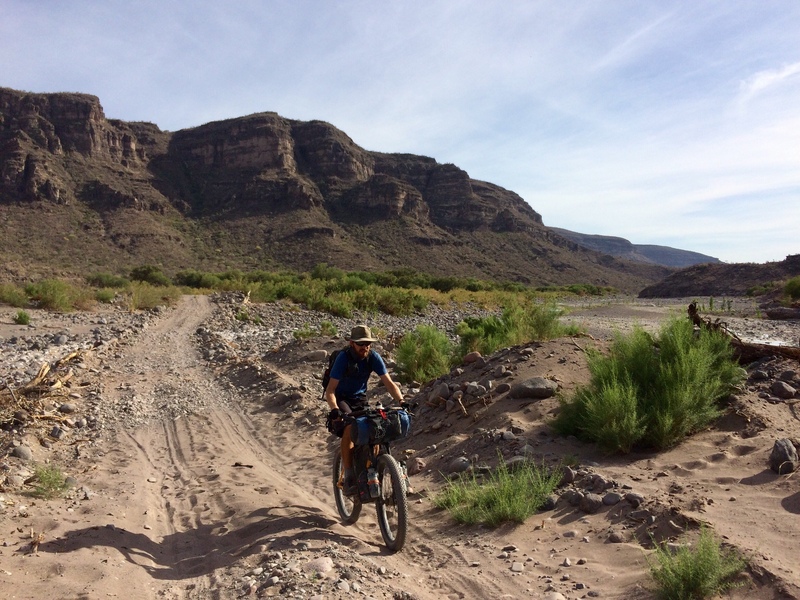 Campbell seemed to have boundless energy that morning and was stretching his legs up front on the well-packed but corrugated track that headed south, parallel to the Sea of Cortez, bearing inland to follow the contours of the mountainous topography. We started climbing and the more we moved inland, the more the air movement dropped and the heat ramped up. A lot. We didn’t discuss it at first (sometimes referring to the obvious discomfort just makes it more apparent), but as we reached the top of another ascent with a panoramic view ahead of vast, arid and shadeless desert, the topic became inevitable. That said, it was already quite apparent from the sweat dripping down our faces. Our estimation is that it hit just under forty degrees celsius. We agreed that we would make use of any tree we might find in the next hour for a lunch break and, if there wasn’t one, we’d get the tarp up for some shade instead. Feeling hot and hazy, we chose to sit out the midday hours under the one unexpected tree we stumbled across. Despite feeling very sluggish, we knew we had to get back to the coast in order to keep up progress and reach our water refill point the next day, so we grudgingly started packing up to get going when Campbell suddenly let out a bemused and mildly concerned “oh dear”. The three litres of water in the bladder in his rucksack, which he had been drinking that morning and which was meant to be the majority of his day’s allowance had already gone! This left him only four and a half litres for the next twenty four hours and seventy five kilometres of strenuous riding. Right. I had been opting for the gradual sipping-all-morning technique, keeping to rations, but this strategy meant that dehydration was quite clearly already upon me. Initially we chose to quietly acknowledge the situation, by noting the issue and agreeing to only sip water and limit ourselves to two bottles for the rest of the afternoon. But that was all that was said and we both focused on moving forward as efficiently as possible. Or as efficiently as you can in near forty degree heat and on sandy tracks. My mouth and lips were so dry that getting some words out even became problematic. My progress started reducing quite quickly and when I started seeing rocks moving by the side of the road, we had to discuss what we were going to do. Plan A – get to the sea and get in the sea. Maybe if we were cooler we could think a bit straighter and also hopefully need less water. Plan B – pray that a car might pass us and that they might have some water to give us. Plan C – go a little further to a beach called San Rafael where our notes indicated that an old man called Pancho lived, who let people camp there. Our notes did not indicate that he would have water or food and clearly it was so remote that he wouldn’t be linked to services. But he was living there, so he must have something. Plan D – burst into tears. We quickly noted that B and D were unlikely or unproductive, respectively. Plan A was all I could think of. All I wanted was to be cold. Fortunately, Campbell was more with it and pointed out that Plan C was the best and only real hope. Fingers crossed that old Pancho was at home that day and still alive and kicking. On finally getting to a tiny ‘San Rafael’ sign, we clambered into a bay and saw a shack with a rather frail looking man in deep conversation with a round, younger one. Trying not to look too desperate, we engaged the men in some polite formalities – the weather, the area, what we were doing – and to our immense relief very quickly the frail man energetically jumped to his feet, announced that he was indeed Pancho and offered us a beer. Hallelujah! We managed to negotiate some water rather than beer (although in my dazed state the beer seemed like a much more attractive option), and soon we were able to cool down, rehydrate a little, be entertained by his three puppies and finally turn around to take in this humble and generous man’s home. My goodness what a beautiful bay. His simple trailer and shack was the modest look-out and he the protector of this perfect beach. We learned that he made coffee each morning for the fishermen who would stop in on their way south from Bahía and in exchange they would bring him supplies from town. He was delighted to offer us a neighbouring shaded terrace to camp on overnight. When we offered money for the water that he gave us and breakfast and coffee he prepared for us, he insisted that only a small tip should be paid. I found myself with yet more sincere admiration for a man with very little, but with so much contentment and generosity. So, crisis averted. Lesson learned. Now we know we’re up to needing 7-8 litres of water a day in this climate, especially on the hotter Cortez coast. It was also a reminder of how good our ‘normal’ life is to have our basic needs at such easy reach – something we certainly take for granted. We forget how lucky we are to have clean water on tap and so rarely find ourselves in a situation of deep thirst. All this heat and dependence on water has made us very excited about the occasional oases that the route takes us through. Spending ninety five percent of our time in the arid desert means that the sighting of a palm tree sets off quite a stir. 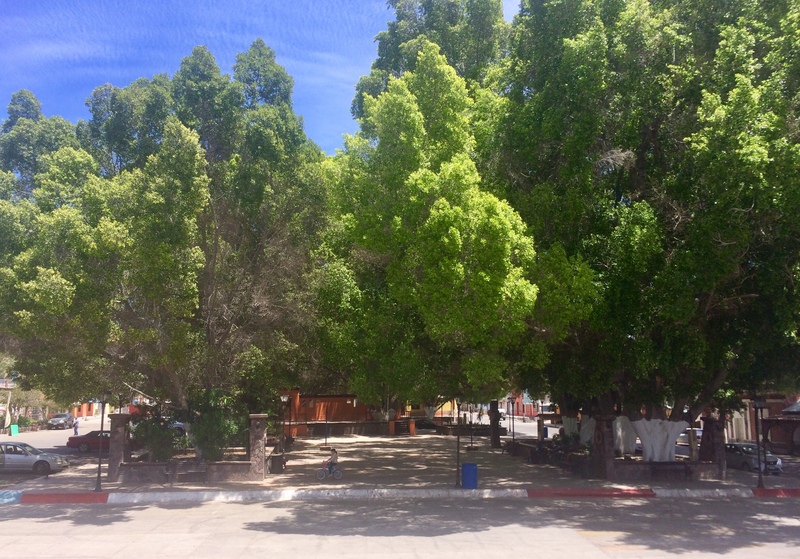 In the last week, we spent a day in San Ignacio, which is such a big oasis that large trees grow in their town square. The shade brings the community together and it was wonderful to see more street life and interaction; toddlers darting round on mini tricycles, ranchers crossing on horses, tourists pausing for a meal and business owners catching up on their daily news. 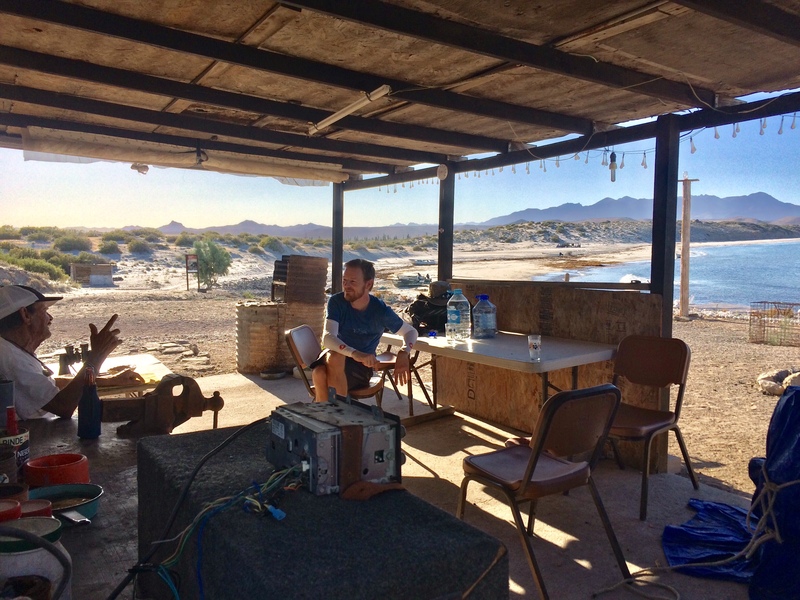 We are now in the seaside oasis of Mulegé after cycling down the sand flats on the Pacific coast south of Laguna San Ignacio, then turning east through a large canyon that cuts across most of the peninsula. Such stunning terrain, despite the challenging track. Even here, where surface water is meant to be present all year round, a drought this year meant that it was few and far between. So rehydration has been the focus of this rest day. It’s almost getting competitive, scored by the number of loo visits per hour! While minimising the bike load was previously heavy on my mind, hydration is now the name of the game. So glad we spoke to you after all this had happened! What a hero Pancho is.